Western blot analysis of extracts from HeLa and NIH/3T3 cells using PRAS40 (D23C7) XP® Rabbit mAb (Biotinylated). Streptavidin-HRP #3999 was used for detection. 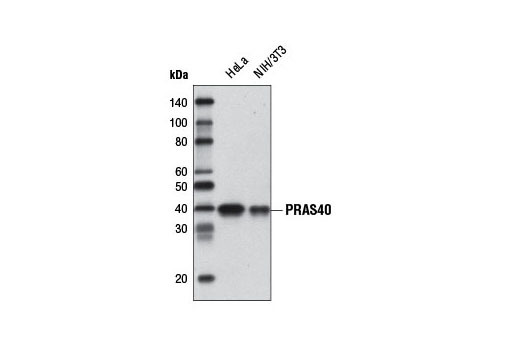 PRAS40 (D23C7) XP® Rabbit mAb (Biotinylated) detects endogenous levels of total PRAS40 protein. Monoclonal antibody is produced by immunizing animals with a synthetic peptide corresponding to the sequence of human PRAS40 protein. This Cell Signaling Technology antibody is conjugated to biotin under optimal conditions. The biotinylated antibody is expected to exhibit the same species cross-reactivity as the unconjugated PRAS40 (D23C7) XP® Rabbit mAb #2691. Many growth factors and hormones induce the phosphoinositide 3-kinase signaling pathway, which results in the activation of downstream effector proteins such as the serine/threonine kinase Akt (1,2). One known Akt substrate is a 40 kDa, proline-rich protein (PRAS40) that binds to 14-3-3 proteins (2). PRAS40 also binds mTOR to transduce Akt signals to the mTOR complex. Inhibition of mTOR signaling stimulates PRAS40 binding to mTOR, which in turn inhibits mTOR activity (3). PRAS40 interacts with raptor in mTOR complex 1 (mTORC1) in insulin-deprived cells and inhibits the activation of the mTORC1 pathway mediated by the cell cycle protein Rheb. Phosphorylation of PRAS40 by Akt at Thr246 relieves PRAS40 inhibition of mTORC1 (4). mTORC1 in turn phosphorylates PRAS40 at Ser183 (5). Cantley, L.C. (2002) Science 296, 1655-7. Kovacina, K.S. et al. (2003) J Biol Chem 278, 10189-94. Oshiro, N. et al. (2007) J Biol Chem 282, 20329-39.